Queen Avenue crosses four sets of railroad tracks, which means the crossing will never be totally flat. 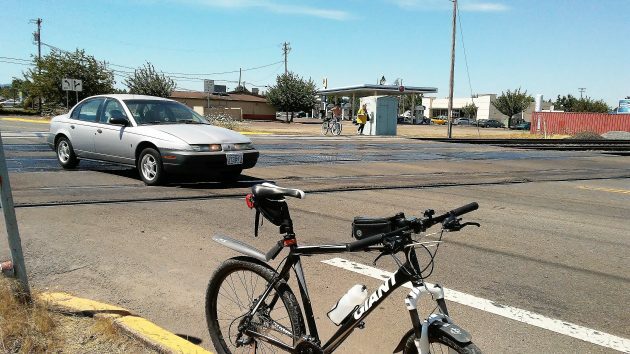 Albany’s busiest railroad crossing on Queen Avenue will be improved for safety one of these days. But it won’t be soon, and when it’s done it will still be a bumpy ride for cars. 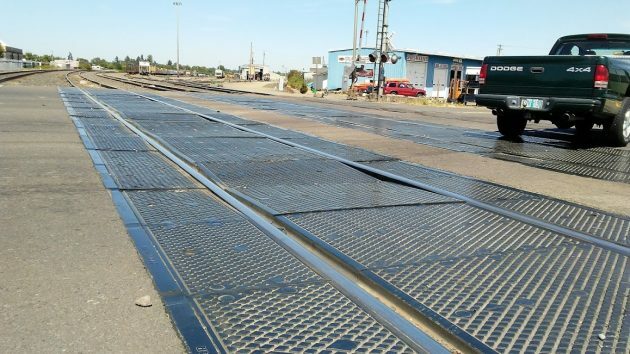 ODOT-Rail wants to reconfigure the crossing gates to make it impossible to go around them when they’re down. This is to prevent fatalities of the kind that have happened there when people mistakenly thought the tracks were clear after one train had passed. The original design for the project called for one of the westbound traffic lanes on Queen to be closed. But that idea has been dropped, and now traffic lanes would not be affected, city transportation analyst Ron Irish told the city council last week. But the project’s timing is uncertain. Shankle has no timeline for when the project will be constructed. But with the various studies and approvals yet to be accomplished, my advice would be: Don’t hold your breath. But as Shankle explained it to me, the nature of the crossing — four tracks on a slight curve — makes it impossible to provide a totally level driving surface for cars and trucks. To provide adequate drainage, starting from the UP main line on the west side, each of the tracks has to be slightly higher than its neighbor to the east. And then, because of the curve, the outside rail has to be slightly higher than its mate. A closer view of track No. 2 at Queen Avenue, the UP’s passing track. Avoid it, and miss the chance to see an non-turbocharged first generation diesel SD-7 switching? Portland and Western’s Albany switcher is older than many or most cars at car shows, and sounds better too! The rail height really isn’t the issue. The crossing was relatively smooth when first laid. What I see is subsidence of the infill between the rails. So we can put a man on the moon, put him in a car and let him drive around. We even supplied a ride home. But we can figure out how to make RR crossings level. I’m sure everything has to be engineered – rail height, slight curve, etc. However, it seems like the slow speed of the trains would negate all those requirements. I recommend you spend more time enjoying the track-side action at the Queen Avenue crossing to check out the varying train speeds. While the local switching chortles along at a slow speed, and Amtrak trains are not fast because they are stopping or accelerating, mainline UP freights go by at 50mph. A good example are the UP double stacks that need the elevation at 50mph around the curve. But the City Council will still spend their time thinking up new “fees” so that they can build mini-parks downtown. If it wasn’t the parklets it would be Talking Waters or some other such essential service. Perhaps an arm of government could underwrite the cost of either a tunnel or an elevated track system to eliminate the current disaster. Mr. Hering has done the community a favor by re-drawing civic attention to a very real minor irritant. CARA seems to know where the money is. ODOT and the affected trackage owners ought consult with Albany Leaders. Crunch a few numbers. There must be a benefit for someone somewhere, isn’t there? I would suggest, Mr. Hering, that you intensely follow the Monday evening Council Working Groups with an eye toward any surreptitious discussion of this or any rail crossing project. I would assist you, but I get the feeling you prefer to work alone. I have studied the Queen street crossing. The frosting efforts have resulted in lipstick on a pig. The base and topping at that juncture is insufficient for the static weight it must bear. A steel frame for the rails works on bridges. Bury a steel frame similar the 1st street rail overpass. Tall trucks have proven no match for its durability.